..... Balance Trading .....: Sell Off Today - A Classical Profit Taking? Despite a 2.5% drop in RUT, there was no wholesale liquidation in small or large caps except for a handful of issues with disappointing earnings reports. Naz tested its 13D EMA and closed above it. 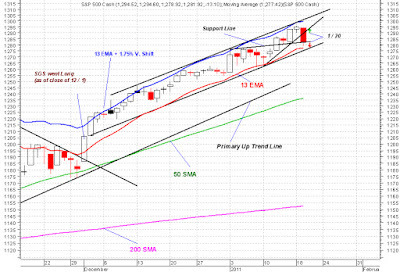 SPX tested its most immediate support and closed above it as well. Primary trend lines in all major indices, except for RUT and TRAN, are intact. RUT and TRAN closed solidly below their 13D EMA's and their primary up trend lines. On the face of it that's negative and points to more selling to come tomorrow, but when their gains since late August 2010 (34% for RUT and 31% for TRAN) are considered, one can conclude that today's sell off was nothing but an healthy and much needed profit taking. I'm planning to buy this dip at some point either on Thr or Fri. That buy would be the 3rd of 4 buys for my IT and 3rd and final buy for my LT. I'll post on FC and Twitter as I buy.